Should the U.S. continue to support autocratic regimes, wherever they provide for a stable geopolitical situation? 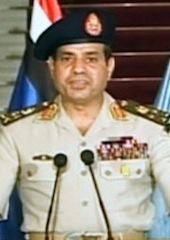 Gen. Abdul Fatah al-Sisi announcing the coup on Egypt's state television on July 3, 2013. The secret of promoting democracy around the world really lies in one's definition of democracy. Free and fair elections are a necessary, but not sufficient condition of democracy. Abraham Lincoln had it right: democracy is government of the people, by the people and for the people. The United States' apparent mission is now promoting elections in every autocratic state. Holding elections in a void can easily undermine the original reason for establishing democracy. The principle of free and fair elections has been at the core of recent U.S. foreign policy. It also is the definition of democracy in the minds of many people around the world. To many, such elections in a country stand for, or are equivalent with, democracy. This simple equation explains why U.S. governments repeatedly find themselves in awkward situations when things do not turn out as expected or hoped for. It all started in 1992, after the Front Islamique de Salut (FIS) appeared to legitimately win the elections held in Algeria. As the Algerian elite watched the potential outcome in horror, the country’s military quickly stepped in and annulled the results. There was deafening silence from the world community, including the United States, in reaction to this coup, which plunged Algeria into a bloody civil war. Few stood up and condemned this blatant violation of democratic rights, because more than anything they feared an Islamist Algeria. In 2005, the U.S. government was surprised by the election gains of Hezbollah in Lebanon and the party’s eventual participation in government. After all, the military wing of Hezbollah had attacked many western targets in the past. Not to be outdone, then-U.S. Secretary of State Condoleezza Rice was “shocked” in 2006, when Hamas swept the elections in Palestine. And she was nerve-wracked over the fact that Hamas continued to reject the existence of the state of Israel. In fact, during a visit to Israel in 2006, a four-star Israeli general confided in me that his biggest security fear had not been Iraq or even Iran. He also dismissed the rather amateurish attacks by Hamas on Israeli citizens as a threat to national security in spite of the regrettable loss of Israeli lives in the process. Instead, he was deeply worried by the U.S. government’s pursuit of “transformative diplomacy,” as Ms. Rice called it. The concept consisted, among other things, of making it the U.S. government’s apparent mission to promote elections in every autocratic state. The general’s biggest fear was that the United States would succeed with that strategy and force Egypt, with which Israel shares its longest border, to hold open elections. There was no doubt in the general’s mind then that the Muslim Brotherhood would win in a landslide, potentially throwing into doubt the peaceful relationship between the two countries. Which takes us to today. The U.S government and other countries around the world supported the removal of autocratic President Hosni Mubarak in 2011 and the free elections that followed. However, the problem is that the United States and many other countries never liked the outcome of these elections. The large majority won in the now dormant parliament by the Islamist Muslim Brotherhood and the large share of the vote won by the even more radical Salafists did not define the “new Egypt” that American politicians desired. A pragmatic, realistic, reform-minded and progressive Egypt was nowhere to be seen. Hence, democratic governments around the world, including the United States, are failing to express a coherent response to the military coup of July 3, 2013. It removed the freely elected President, Mohamed Morsi, a representative of the Muslim Brotherhood, who assumed office in June of last year. Whether the view is explicitly expressed or not, returning to the “status quo ante” even via a coup is not all bad in their view. After all, the Mubarak regime, which was in power for nearly 30 years prior to the Arab Spring, had been fairly stable and had served as a predictable ally to U.S., European and Israeli foreign policy interests. The question then arises whether the U.S. government should continue to support autocratic regimes wherever they provide for a “stable” geopolitical situation. Of course, it is part of any country’s realpolitik to make decisions that are perceived to be in its own national security interest. While recognizing realpolitik, the secret of promoting democracy around the world really lies in one’s definition of democracy. Free and fair elections are a necessary, but not sufficient condition of democracy. Enthusiastic and unquestioned support of elections without the necessary groundwork can lead to unpleasant surprises. After all, following the election of Mr. Morsi, Egypt had not suddenly turned into a democratic country. The military maintained its dominant role in society. Government institutions continued to lack the capacity of serving their citizens in a fair, equitable and efficient manner. And Egypt’s judiciary maintained the biases of the past. Abraham Lincoln had it right when he defined democracy as government of the people, by the people and for the people. In other words, there is a lot more to democracy than holding elections. First, a society must have in place or intend to build institutions that allow its citizens on a daily basis to participate in all aspects of the political process. Second, a democratic society must guarantee that all people are equal before the law. That, in turn, demands an independent and apolitical judiciary. Third, a true democracy acknowledges and respects all cultural, ethnic or religious differences that may exist within its borders. Fourth, freedom of opinion without fearing repercussions from those who have been elected is also critical. Of course, there is also the true purpose of government, i.e. to do its best to sustainably, responsibly and transparently serve the people in an effort to improve their standards of living in an equitable manner. In other words, holding elections in a democratic void can easily lead to outcomes that might in the end undermine the goal of achieving democracy itself. Of course, there are many aspects to democracy that are left out by my short definition and philosophers have spent their lifetimes in an effort to arrive at the perfect definition. However, one thing is for sure: Elections alone do not define democracy. By broadening foreign policy in favor of promoting the more inclusive concept of democracy rather than simply elections, the U.S. government and other democracies avoid the Egyptian conundrum following the military coup. Equally, such approach may trickle down to democratizing countries avoiding their peoples’ deep disappointment gap between reality and expectations following any first-time electoral process. Finally, democracy is neither perfect nor perfected anywhere in the world. Truth be told, even 224 years after its constitution was framed, there is still a lot of democracy to be realized in the United States itself.